For all the talk about how great infrared light is and how many benefits it has, there isn’t a whole lot of information out there on how exactly you’re supposed to do infrared light therapy treatments. Here are the basics- what you will need to do an infrared light therapy treatment. Each person is different, so you may find that other items are must-haves for you (such as an anti-slip floor mat if you are concerned about slipping on a hard floor or an extension cord if your lamp’s cord isn’t long enough to reach the socket). Once you’ve gathered your supplies, you need to set up your lamp. Check that your clamp lamp is rated for 250 Watts (if using a 250W bulb) or higher. Check that your lamp’s socket is made of porcelain or another heat-resistant material. Check that your infrared bulb is NOT Teflon-coated, also known as “shatterproof”- these bulbs release invisible, odorless toxic fumes. 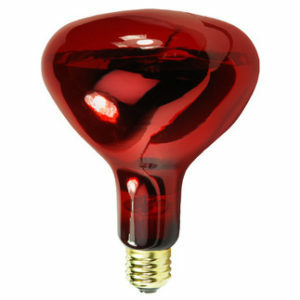 With the lamp unplugged, screw your infrared bulb into the lamp socket securely, just as you would any other bulb. Set the lamp down. Take the metal bulb guard that came with your clamp lamp and place your piece of wire mesh behind it. You can affix the mesh to the guard by poking the ends of the wire guard through some holes near the edges of the mesh. Attach the wire guard to the reflector bowl of your lamp. If any sharp edges are sticking out from the wire mesh, tuck them under so they cannot scratch anything or get stuck on anything. Clamp your lamp to a secure, stable object and adjust it to point to where you plan to be sitting or standing. If your lamp’s adjustment uses a wingnut, this should be easy to do. However, if it uses a bolt instead, you may need to grab a wrench to loosen the bolt, adjust the lamp and then re-tighten the bolt so the lamp doesn’t move. Do not place the lamp so you will be underneath it. If it shatters or falls, you could be injured. Instead, place it where no one (and preferably, nothing) will be underneath it if it falls. This is very important because many metal clamp lamps have clamps that are not very secure or strong. Another step you can take is to use metal wire or brackets to secure the lamp to a stationary object. Make sure your lamp’s plug can reach whatever socket you’re going to use. If not, you’ll need an extension cord. Most clamp lamps do not have an on/off switch on the cord, and you must unplug them to turn them off. Therefore, try to use an electrical outlet where you won’t have to reach over or past the infrared bulb in order to unplug it. Doing so will minimize any risk of accidentally touching the bulb. Now you’re ready to rock and roll. Get your eye protection, put it on and make sure it fits well. Set a timer for your desired treatment time. This is important because many people get so relaxed they feel like falling asleep during infrared light therapy treatments. Plug in/turn on your lamp. If necessary, make minor adjustments to the lamp’s direction so it points exactly where you want. You may need to move your body around somewhat to keep the light from concentrating on one single part for too long and making you uncomfortable. Use the light for 5 to 20 minutes. Use a towel to wipe away any sweat you want to remove. Do not use something that is not absorbent (such as your hand), because if even a tiny droplet of sweat gets flung into the infrared bulb while it’s hot, it may shatter. If you’ve sweated profusely, you may wish to immediately shower after your treatment to wash off excess oil and dirt. This is especially true if you are concerned about acne or infection. What Should I Expect During and Right After My Infrared Light Therapy Treatment? You will feel warm or hot and you may sweat, even if you are only using one bulb. Your skin may appear red afterward due to the heat and increased blood flow. The redness will go away in less than an hour. You will probably need to gently adjust your position throughout the treatment so the light doesn’t focus on any one area for too long. Otherwise, leaving the light on any one point for too long may make you feel uncomfortably warm or hot. You may feel extremely relaxed- so much so that you might even feel like dozing off. This is why I suggest sitting up during your treatment and setting a timer. If previously depressed or anxious, you may notice that you feel less depressed or anxious afterwards. Stiff muscles and joints will warm up and it may become easier to move or stretch them. After a treatment, you will likely notice that any pain you had is lessened. This is usually a temporary effect, but repeated treatments over time can help heal the injury causing the pain, so long-term pain relief can also be achieved. This seems to depend on the individual, though. If you had lactic acid buildup from strenuous exercise, discomfort from it may dissipate more quickly than usual. Your muscles will recover more quickly as well. What Should I Expect After Several Near Infrared Light Therapy Treatments? You may find that you have less pain overall and that old injuries are healing. You will likely notice that you have increased hair growth in treatment areas. The hair is likely to grow faster and thicker. This includes “undesirable” hair, such as unwanted facial hair or ear hair. Skin will usually look healthier overall, and people often notice other positive changes, such as less sagging, more plumpness/collagen formation, under-eye circles that are less noticeable and a reduction in acne. Collagen formation will improve. If the tissue in question is deeper than the skin, such as a ligament, it will probably take some time to see improvements. How Often Can I Do Infrared Light Therapy Treatments? You can do more than one treatment per day, but you have to allow at least a few hours in between them. Doing treatments back-to-back won’t speed up your results and it might even undo the benefits you received from infrared light therapy treatments that day. You have to allow your body time to repair itself and then it will be ready for more near infrared light therapy. Lots of people want to know exactly how many treatments they can do in a single day. This can vary from person to person, so everyone should start slowly and gradually increase the amount of time and the number of sessions until adding more doesn’t seem to have any additional benefit. Some are able to do as many as four treatments a day, but it isn’t necessary to do that many per day to get results. In fact, you may still get noticeable results if you only use near infrared light therapy a couple times a week. Although near infrared light therapy using a single lamp is beneficial, many people want the added benefits of sauna therapy. For this, you would need more than one near infrared light therapy bulb. Because near infrared sauna therapy is slightly different from near infrared light therapy using a single lamp, I am going to cover that topic separately in detail. Keep an eye out for that post, and for now, enjoy your infrared light therapy treatments! This entry was posted in Infrared Light Therapy and tagged infrared light therapy, infrared light therapy how to, near infrared light therapy by Bambi. Bookmark the permalink.